Craghoppers says:"Compson Jacket is packed with new contemporary technical touches, including striking split-colour design, neat fused pockets and moulded cuff adjusters. A jacket that will shrug off the worst of the showers in considerable style." The Craghoppers Compson jacket fitted well - it is true to the stated size - with ample room for a fleece. The length is good as it is long enough to cover the top of your thighs. My only angst on fit was that the sleeves were a little long on me - not a problem I have often. The cuffs, waist and hem all adjust with well secured toggles that are constructed so the cord is out of the way. This means there are a variety of ways to adjust the level of warmth and to adjust the fit to suit your body shape. The freedom of movement around shoulders is very good. The hood, which does have a volume adjuster at the back, is large enough to allow you to wear another hat underneath it and when fastened with the face-guard provides a reasonable level of protection to the face. Again, there are no annoying, flapping cords. The level of 'cosiness' is helped by the fact that the collar has a lovely fleecy lining. The front, main zip has a storm flap, moves easily and has a good sized toggle which is readily usable with gloved hands. There are a number of pockets. Outside the jacket, there are two side pockets at waist height. Unfortunately, these are not accessible when wearing a belted backpack. However there is also a fused, zipped pocket at the front which is big enough for gloves or hat - but not both! On the inside there is a (not very obvious) OS map sized pocket with zip plus two other zipped, dry pockets. The jacket has kept me dry during periods of really quite heavy rain. I have worn jackets which are more breathable than the Compson - but they also cost rather more! I have not used the jacket for long enough to really evaluate its durability - but there don't appear to be any reinforcement in areas such as the shoulders or elbows. 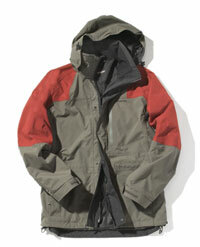 The Craghoppers Compson waterproof jacket is a good value, contemporary looking, but relatively heavy jacket. Whilst you might need a lighter, more technical jacket for winter waling in the higher peaks of Snowdonia or Scotland, this is a great option for year-round low level walking or for mountain walking in the Lake District.